It’s Day 4 of “THE 12 DAYS OF CHRISTMAS COOKIES” and today I’m featuring my ultimate favorite Christmas cookie, the biscotti. Each year I make batches upon batches of this cookie and give as gifts (and, of course, a big batch for us to keep as home). These twice-baked cookies (biscotto means twice baked in Italian) are meant to be wonderfully hard and crunchy (not soft and cakey like many US versions), making them perfect for dipping into coffee, hot chocolate, or a nice vin santo after dinner. Change up the extract and nuts or add orange zest or dried currants or cranberries for different variations. 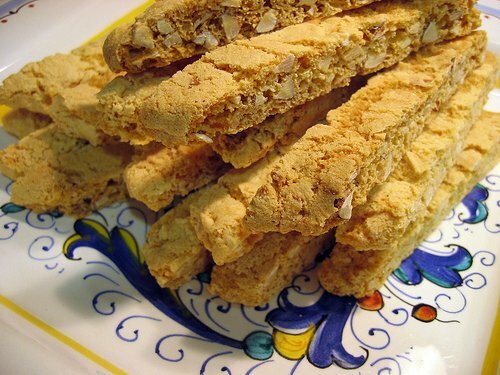 The biscotti recipe below is my favorite almond version. Get your standing mixer out and let’s get baking! Sift together flour, sugar, baking powder, baking soda, and salt. Add 2 whole eggs and 1 egg yolk, almond extract, and almonds. Mix thoroughly until dough holds together. Add half of reserved egg white, if necessary, to make a cohesive dough. With wet hands, shape dough into 4 logs, each 6” long and 1 ¾“ in diameter. Place 3-4” apart on baking sheets. Bake on middle rack of oven until logs are light golden brown and spring back when touched (about 24 minutes). Cool 15 minutes. Lower oven to 275. Slice logs with a serrated knife diagonally into 1/2” slices. Return to oven and bake until completely dry and crisp throughout (about 40 minutes). Cool.